Don't Miss the first Blog Series of 2019.
with "Gate" beginning This March. Click on the Image to Start the Series. The Road2Wholeness Blog is an offering of the GEMS I've been collecting along my personal road to wholeness. The purpose of this Blog is to encourage, empower, and enrich the lives of women who are pursuing healing. I am a writer, teacher, thinker, and speaker. Ultimately, my interest resides in the areas of Emotional Wellness, Spiritual Awareness, and Personal Development. I believe our Road2Wholeness to be a road to remembering our Divine Birthright, and I encourage those who feel broken to begin the journey of remembering through the practice of stillness. On the blog, I mainly share insights on Self-Love, God's Love, Forgiveness, Purging Toxic Emotions, Emotional Weight Loss, and Mindset Building; all of which I've had to develop, bring into awareness, or overcome personally. In each blog that I write, my goal is to go beyond the surface, in order to help uproot the idea of brokenness and inefficiency. To learn more about me and the mission of The Road2Wholeness Blog, visit the "about" page. Once again, I welcome you and I invite you to take a stroll with The Road2Wholeness Blog!! The Decks and the Road Novel Series serves as an extension of the already established foundation by the author NaTisha R. Williams, of characterizing ‘The Decks of Our Lives’ and ‘The ­Roads of Our Lives’. The first novel in the Suspended-Release Series Freeborn was released beginning October 2017. Whereas Freeborn was a pull from the deck, Erased the second book was a call from the Road. Now we complete the 3-book series with the novel Renegotiating Kaylin, a token title that creates a full circle for the author. The series began with two of the main characters from the author’s first novel Renegotiating Kayla, and expounds on several of the characters introduced in the author’s second novel A Better Pair of Shoes. The novel series covers a wide scope of life and social issues. In Freeborn, Williams opened up with family legacy. Building an unlikely couple, the author used the characters Tayeton Fisher and Dr. Kat Shepherd to pose tough questions. In each book, the series continues the tug of war between the cards we’re dealt and the roads we choose. Throughout the series characters are shifted in and out of leading roles. In Erased some passive roles became pivotal, and before the road runs out on this 3-book series, readers can expect to meet three generations of family. The series is Free online at Blogger at thedecksandtheroad.blogspot.com. Also on the Blog, readers can enjoy award presentations for Character Performances, Most Influential Voice, Best Character Introduction, and more. Visitors to the site should use the white drop down arrow under the subscribe feature to navigate the book. 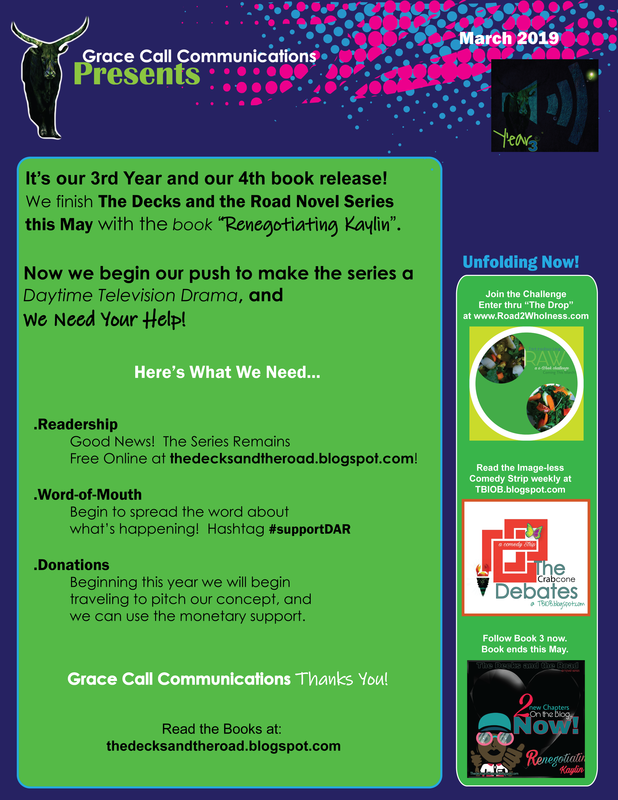 To read the synopsis for book 3 or to find out more about the series' push to become a Daytime Drama, visit the blog. Join Renegotiating Kaylin, a Suspended-Release Novel Event between Feb.